As soon as the calendar flipped over to July, I could feel the slow descent into winter begin. I was already planting fall crops, and the scorching heat in June made our normal summer temperatures in July feel relatively cool. Despite seeing winter on the horizon, our summer crops are coming in with a vengeance. I sent Mark to town Tuesday with two big bags of squash and cucumbers --- "and don't come home until they're all gone!" (He foisted the vegetables off on appreciative librarians.) I'm saving seeds and freezing winter soup as fast as I can too, of course. Even the winter keepers are starting to ripen. 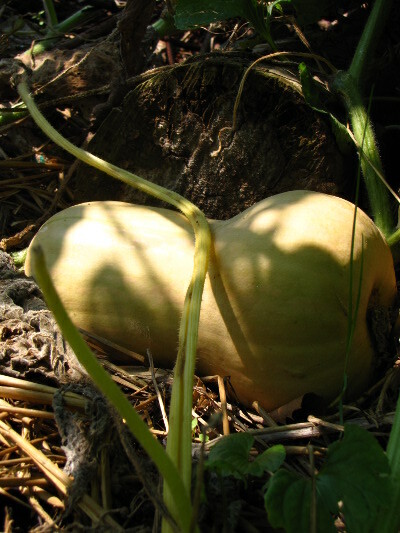 The earliest-planted butternut squash are turning brown, and the leaves are beginning to lose their vibrant summer form. It's hard to believe that we only have five frost-free months to grow all of these tender vegetables, but somehow it all gets done (and they all get eaten). Good thing we budget time to simply enjoy the bounty! Our chicken waterer lets you go out of town for a weekend or a week without worrying about your flock. August sixth is cross quarter--halfway between the beginning of summer and beginning of fall. I've noticed dry pecan leaves piling up against the front steps, and katydids beginning to call. I started our garden late, so I didn't get as much planted as I wanted. Using the huggleculture method really helped us grow bigger potatoes. So I have an area in the back with 3 new huggle rows for potatoes next year. I am also starting one up on the hill behind us for potatoes the following year. My winter cabbage is growing nicely in 1 gallon pots and I put carrots in one gallon pots and they are coming too. Excited! I will be building a huggle pile behind the trailer for sweet potatoes next year. Hope they turn out good. I followed your advise with our winter squash and added more nitrogen. Low and behold, the witner squash took off like a gray hound. Ha! Ha! 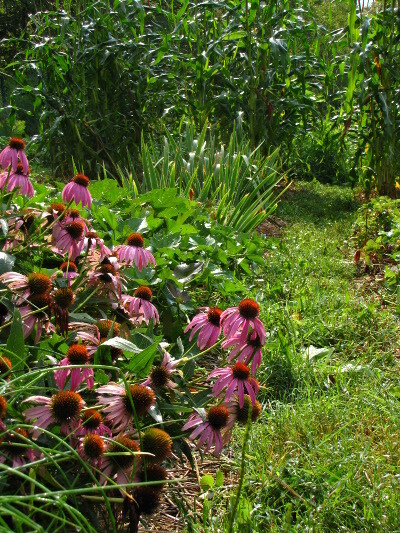 Mona --- Glad to hear your garden is thriving! I'm also excited to know that nitrogen perked your winter squash right up. I hope the rest of your year turns out as well!